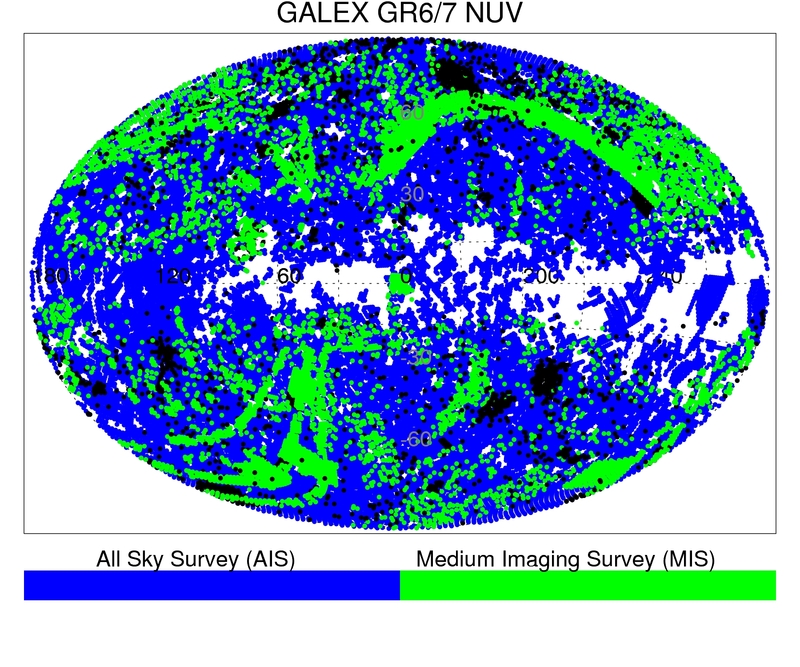 GALEX (The Galaxy Evolution Explorer) performed the first extensive sky surveys at Ultraviolet wavelengths, filling the last gap so that our view of the sky is complete across the electromagnetic spectrum. The imaging surveys resulted in almost 600 million source measurements in two UV bands, far-UV and near-UV. What are these sources? 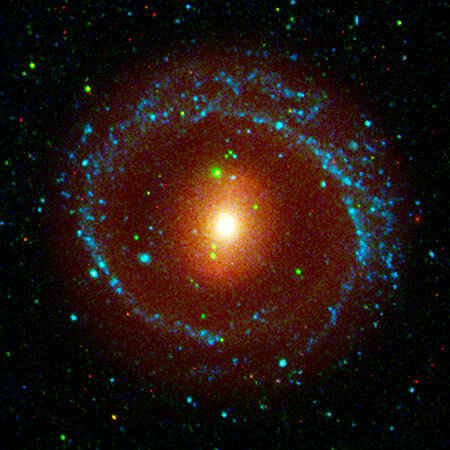 How many are Milky Way stars, galaxies and quasars? How are they distributed across the sky, and in color, magnitude, luminosity? How to extract samples of UV sources by astrophysical class? What peculiar classes of objects can be discovered from the GALEX data? The "UV sky" project and the papers below seek to answer these questions. The project provides several science-ready catalogs, as well as some model grids and tools to facilitate science exploitation of the GALEX data, alone and matched with surveys at other wavelengths. Catalogs of Milky Way Hot White Dwarf Candidates from GALEX's Ultraviolet Sky Surveys. Constraining Stellar Evolution. * Discovery of QSOs with anomalous FUV-NUV color: Ly_alpha enhanced? The GALEX database in MAST contains almost 600 million UV source measurements; same sources have repeated measurements (useful to search for variability, for example), due to repeated observations of the same field or overlap between fields. 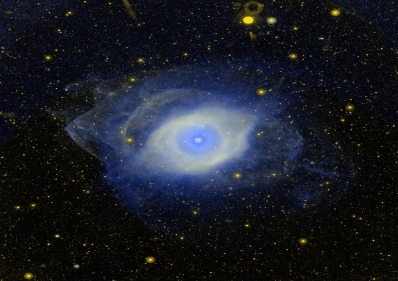 To estimate density of sources across the sky or the number of sources with given magnitude or color ranges, or to match UV sources with other catalogs, a source catalog is needed in which each astronomical source is counted only once. We therefore constructed catalogs of clean, unique (i.e. only one entry for each object) UV sources from the GALEX database. One also must weed out artifacts and bad measurements from any extracted sample: flags are included. And, we included other flags useful for science analysis of the catalog sources, for example flags indicating whether a source is within the footprint of a large galaxy or stellar cluster (see Bianchi et al. 2017 arXiv:1704.05903 or ApJ Suppl 230, 24 ). 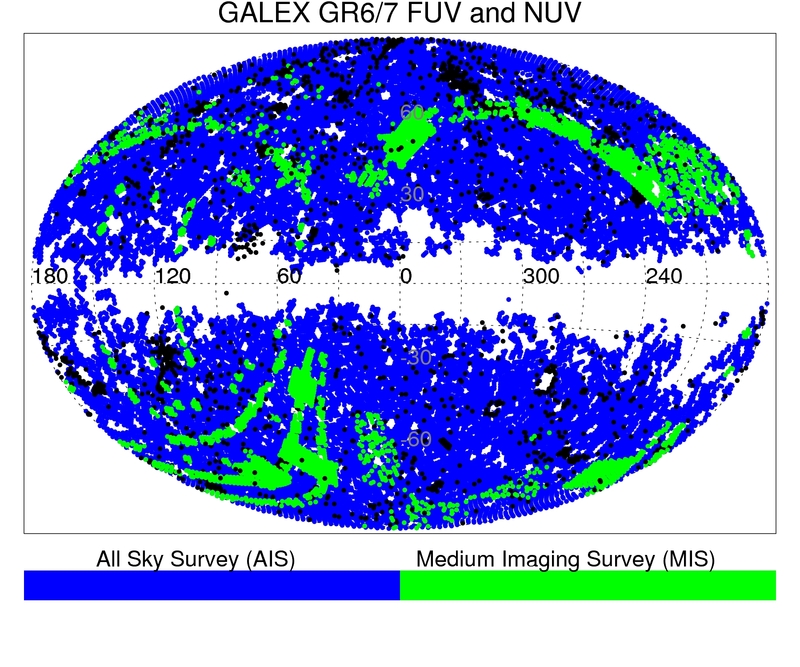 AIS (All-Sky Imaging Survey, depth about 19.9/20.8 FUV/NUV ABmag). The new catalog GUVcat expands, improves and replaces the previous catalog BCScat. In particular, we patched some fields that had beed incorrectly merged by the pipeline (a bug that had introduced some flawed sources and artifacts in the database and in previous catalogs), and added useful tags for science analysis. 1) only observations with both FOV and NUV detectors turned on are included. This is useful for any science analysis where the fraction of sources with a given FUV-NUV color is of interest, or to estimate the fraction of sources with significant detection in both FUV and NUV over the total number of NUV detections. Note that the basic GALEX database gives FUV magnitude = -999 in both cases when the FUV detector was off, or the FUV detector was on but the source's FUV flux is below detection threshold. 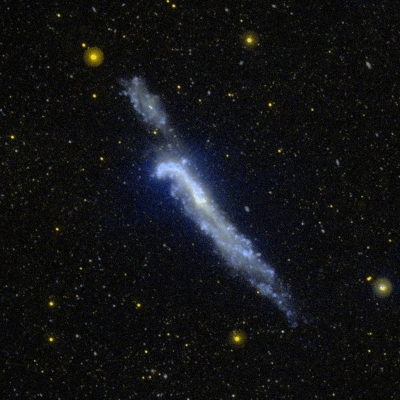 More observations exist in the GALEX archive taken with one detector off (mostly FUV); those can be found in the galex.stsci.edu MAST database. 2) only sources within 0.5 degree of the field center are included, to avoid sources with poor photometry/astrometry near the edge, and rim artifacts. This makes the catalogs useful for statistical analysis of sources with homogeneous quality, without great loss of area coverage (also considering that overlap exist among several fields). Users interested in a particular source that happens to fall on the rim of a GALEX filed, should obtain its measurements from the main database and carefully examine the quality. 3) we retained sources with NUV magnitude errors less or equal 0.5mag (see Figure 4 of Bianchi et al. 2011 MNRAS , and Figures 2--4 of Bianchi et al. 2011 ApSS for effects of error cuts on the resulting sample statistics). 4) The general GALEX database contains all measurements for sources with repeated observations. We removed duplicate measurements to produce a unique source catalog as follows. GALEX sources within 2.5'' of each other, but from different observations, were considered duplicates. In such cases the object from the observation with the longest NUV exposure time was retained, and - in cases of equal exposure times - the object closest to the center of the field of view. Reference: Catalogs of Milky Way Hot White Dwarf Candidates from GALEX's Ultraviolet Sky Surveys. Constraining Stellar Evolution. Safety constraints (countrate brightness) prevented observing of the bright LMC and SMC central regions during the main GALEX mission, but the survey was completed in NUV at the end of the mission. For an overview of area coverage and exposure level in FUV and NUV of the Magellanic Clouds, see Fig. 5 of Bianchi 2014, ApSS, 53 , 939 . Sources are too crowded in the MC galaxies and their periphery for the standard GALEX pipeline to perform reliable source detection (the database photometry should be used with great caution! ), therefore we performed custom photometry in the GALEX fields within 15 degrees of the LMC and and 10 deg of the SMC, covering also the Magellanic Bridge. Current coverage with both FUV and NUV measurements includes ~550 square degrees in 1460 overlapping GALEX tiles with exposures typically at AIS depth (magnitude limit about 19.9[20.8] ABmag in FUV[NUV]), but occasionally reaching MIS level (about 2 mag deeper). The remaining area has NUV-only data. The catalogued GALEX detections are being matched to optical source catalogs to produce a multi-wavelength database.